This marvelous pie has been impatiently seething in a drafts folder for three months. Lemon meringue pie is my mom's favourite dessert (her other fav, depending on her mood, is Boston cream pie). For Mother's Day I managed to bake up this mile-high meringue deity in the span of eight hours; something I do not recommend...unless you want to curse at & wrestle with, sticky pie dough. Still, everything came together deliciously in the end. 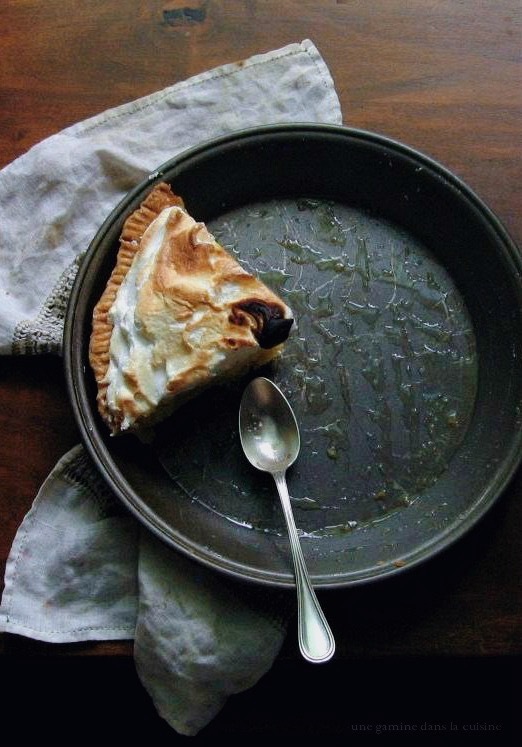 The filling had the ideal amount of tartness (I loathe lemon & key lime pies that are too sweet), and even though I singed the meringue, it was a perfect fluffed-up, sweet balance to the plucky filling. Oh, how I've missed my beloved lemons! In separate small bowl combine ice water with apple cider vinegar. Sprinkle about 2 Tablespoons of ice water mixture over flour/butter mixture. Use a bench scraper to mix/cut until water is incorporated into dough. Adding about 1 Tablespoon of ice water mixture at a time, continue to mix/cut until dough just starts to form a ball and holds together when pinched (you probably won't need to use all the ice water/vinegar). Gather the dough into a ball - if necessary, wet your fingers and gently nudge any dry bits of dough into the ball. Shape the dough into a flat disc and wrap in plastic. Refrigerate for at least 4 hours or overnight. On floured surface, roll the chilled disc of dough out into a 12-inch circle (about 1/8-inch thick). Gently place circle into a 9-inch pie plate and trim the edges so there's about a 1-inch overhang. Tuck excess dough under and crimp edges with your fingers or the tines of a fork. Cover and chill for at least 30 minutes. Remove crust from oven and place onto cooling rack. Cool completely before adding the filling. In a medium bowl, whisk 3 eggs till combined. Separate remaining 5 eggs, adding the yolks to the whisked whole eggs & beating to combine. Place the whites into a separate large bowl. Cover the whites and set bowl aside until ready to use (for meringue). In another separate bowl, whisk together 1 1/2 cups of sugar and cornstarch. Whisk in beaten eggs, lemon juice and salt. Transfer to a medium heavy-bottomed saucepan. Whisking almost constantly over medium heat, bring the mixture to a full boil. Reduce heat to low and let bubble for 30 seconds (bubbles should be languid & slow). Remove thickened filling from heat and whisk in butter until completely melted. Strain mixture through a coarse-mesh strainer (to catch any egg bits). Stir in lemon zest. Press a piece of cling wrap directly onto filling and refrigerate until it reaches room temperature. 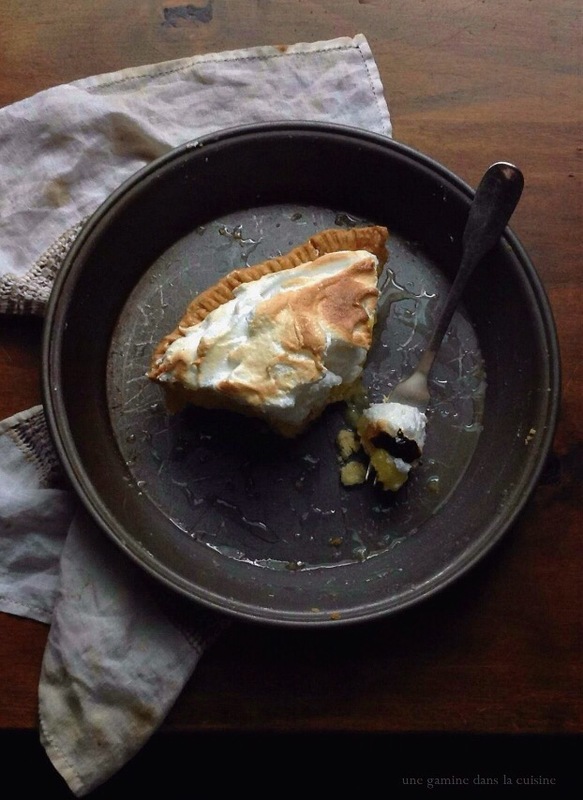 Pour filling into baked crust; refrigerate while you prepare the meringue. Meringue; in the bowl of a stand mixer, fitted with whisk attachment, beat reserved egg whites until soft peaks form. One tablespoon at a time, beat in remaining 1/2 cup + 2 Tablespoons of sugar, beating until whites develop stiff, shiny peaks. Refrigerate pie until ready to enjoy. I too have felt that reticence about blogging...I wonder if there's just something in air right now. I also wholeheartedly agree with your dislike of lemon or lime pies that are sickeningly sweet. I like the balance between sweet and tart, leaning ever-so-slightly into the side of tart. Welcome back! I think we've forgive you for your absence since you brought pie ;). And oh, what a pie! I applaud you for making this in only 8 hours…3 days is more like it for me! Anyway, welcome back. It is always a pleasure to read you and admire your lovely pictures. This is one of my favorite pies. Welcome back! It's always a pleasure to see/read what drops into my inbox and it feels like a gift no matter how infrequent! If photography is your Achilles Heel, do a victory dance...your images are always gorgeously tempting. Thanks for plunging in again...glad to see you in my inbox. Your photos are stunning and convey the deliciousness of each of your recipes. What a joy to read a new post from you! I've been missing you desperately, and I wish you weren't so hard on yourself. I have to admit that I'm the queen of the imperfect photo, but I'm always enchanted by yours and think they're perfect. Don't stray away again, please! Welcome back - we missed your posts! 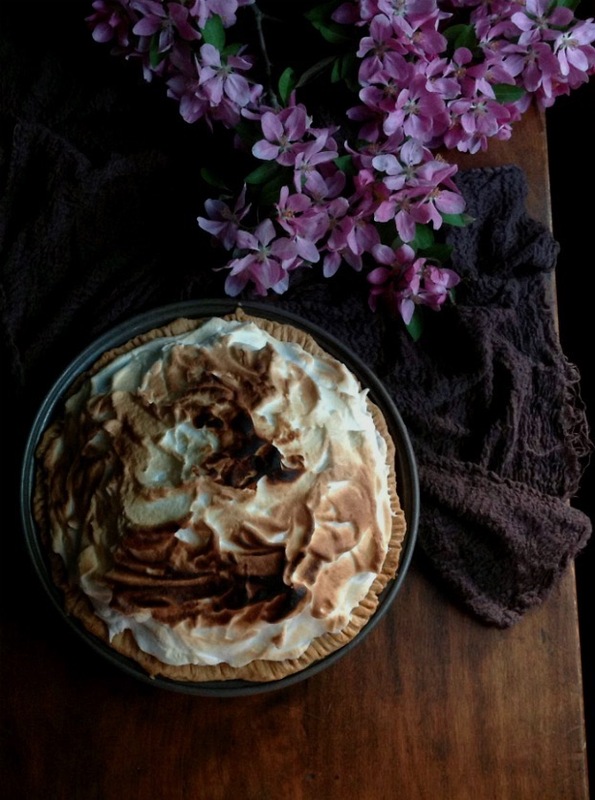 This is a stunning pie and lovely photos. Oh, I was so excited to see this post in my Bloglovin' feed, Valerie! I adore your posts, and always look forward to them. These photos are just gorgeous, and yes, photography can be difficult! But even with my DSLR, I always manage to find flaws in my pictures. Yours are invariably stunning. XOXO! Aw, thank you Abby! It's soothing to know that even DSLR cameras can be feisty & difficult. Your photography has always amazed me... you would NEVER know that you don't have a super fancy expensive camera. Seriously. Oh and you were missed! Your blog is such a pleasure to read and your photos make me want to reach into my computer. I am literally drooling onto my keyboard whilst my co-workers give me looks of disgust. So pleased to have found you!